NOTE: Text to Speech is only available on Windows. 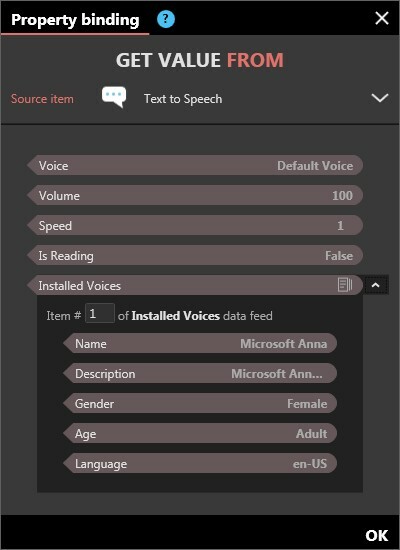 The Text to Speech (TTS) interface asset uses the Microsoft Speech library to read aloud text, whether that text was predefined in Composer, came from an external data source like a Twitter feed or had been entered by a user via the Text Input control. All languages and voices installed on a Windows PC are available for speech synthesis. Make sure when deploying an experience that all PCs have the same voices / languages installed. The list of available languages is determined by both the version of Windows and the installed voice packages. For a list voices available from Microsoft, see Microsoft's documentation. Information on the Web for installing additional voices is quite poor. This third-party article does cover the topic but we have not verified its accuracy and will not support attempts to follow it. Voice: Specify your preferred voices, separated by semicolons (;). Use the value(s) in the Name column of the Voices table found here in Microsoft's documentation. List more than one if you might be deploying to PCs with different installed languages. Intuiface will go down the list and use the first one available on each PC. Instead of a list of names, you can enter "Default" or "Default Voice" to use whichever language the PC considers to be its default voice. Volume: Volume for the selected voice. Speed: Speed for the selected voice. Can be any value between -10 and 10. A value of 1 is the default speed used by the Microsoft OS. All of the properties listed below are read-only properties and thus only accessible via binding. Is Reading: true / false value specifying whether text-to-speech is actively occurring at the moment it property is read. Synthesis completed: Raised when speech synthesis has completed. Synthesis started: Raised when speech synthesis begins. Start synthesis: Begin speech synthesis for specified text. Text: the text to synthesize. Cancel synthesis: Cancel in-progress speech synthesis. Pause synthesis: Pause in-progress speech synthesis. Resume synthesis: Resume all in-progress speech synthesis. 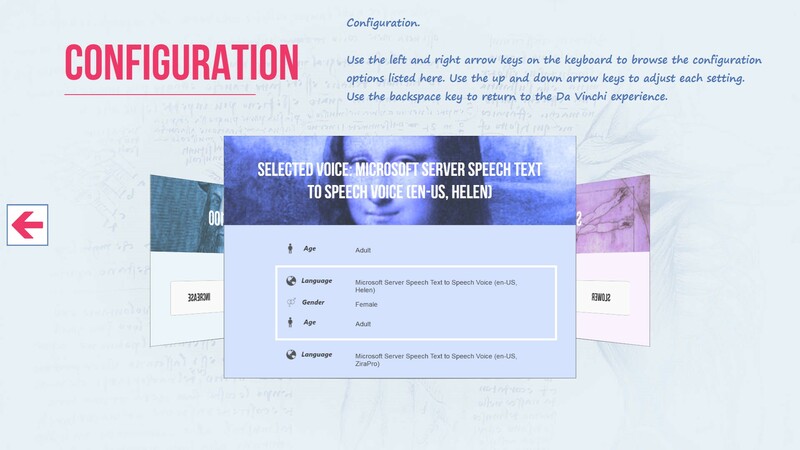 Download and study the DaVinci - Accessible on our Marketplace as it illustrates this Text to Speech feature. Note that you can even use keyboard triggers to navigate within this experience.